JAKARTA-INDONESIA, Acts of violence against the people become the way that run by reactionary puppet regimes in the half feudal-half colony country (Third World) to perpetuate the exploitation and oppression to the people. Monopoly and land grabbing of peasants, ethnic minorities and fishing is the main instrument that run by reactionary puppet regimes through the big comprador bourgeoisie and landlords in order to serve the interests of imperialism, especially the US. On the global capitalist crisis on 2008 until today, the reactionary puppet regimes in third world countries is more massive to oppress and exploited the people. Acts of fascism , that shown clearly or show covertly, shown to usurp the rights of the people. It can be seen from the act of shooting and brutal arrests were made by the government of the Philippines in Benigno Aquino regime.(01/04/2016). Hundreds of peasants and Lumad (ethnic minorities) Kotabatu, Mindanao, in the Philippines fired with Rifles M 16, by the combined forces of the police and air force of the Philippines, which was held a peaceful protest demanding food and quick handling by the government on the condition of drought which affected people over this past month. The protest was made because the drought affected make the destruction of communities plant, the food crops (rice, corn, bananas) and also the other crops such as oil palm, coconut and rubber. In such condition, the Society has run out of food stocks and very difficult to meet the life necessities. In fact, the society experiencing hunger. However, the government of Benigno Aquino still slow to resolve this problem. 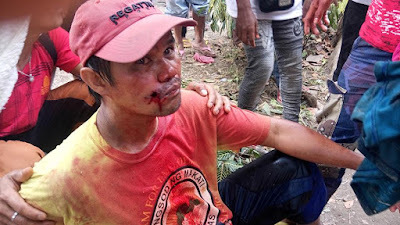 So based on the presentation, FRONT MAHASISWA NASIONAL central committee denounces and condemns acts of violence shootings, arrests and enforced disappearances of peasants and ethnic minorities by the government of Benigno Aquino. We also demand, to UN agencies or international tribunal to investigate and prosecute this human rights violations, were conducted by the Philippine government to the people, for the sake of upholding justice and human rights of the people of the Philippines.